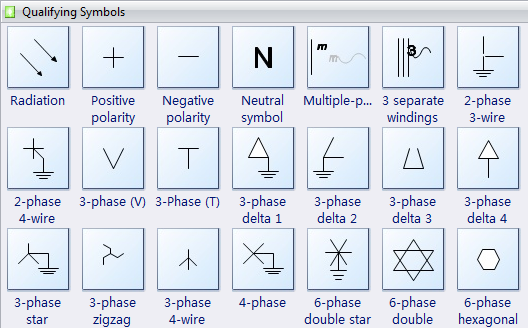 The following qualifying symbols show some electrical schematic presentations symbols such as radiation, positive polarity, negative polarity, neutral symbol, separate windings symbol, 2-phase 3-wire symbol, 3-phase symbol and 4 phase symbol. A polarity symbol is represented on the case indicating which type of plug is needed. Positive polarity is a physical end at where protons from/of an atom gathers. It seems that + Symbol. Negative polarity is a physical end at where electrons from/of an atom gathers. It seems that - Symbol.